Two whales were washed up on the Cumbria coast, officials have said. 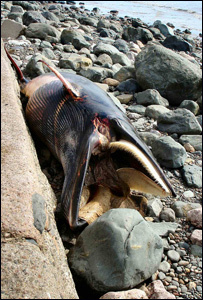 A dead 20ft minke whale was discovered after Friday's high tide at Seascale. It has now been confirmed that a second animal was a minke calf. Experts from the British Divers Marine Life Rescue (BDMLR) are investigating the deaths. The deaths come as a whale watch began to establish numbers off the Cumbria coast. Copeland Council is working to remove the remains from the beach. Minke whales can grow up to 30ft long and have been seen off the coast of Scotland, although they prefer cooler regions to tropical areas. A spokeswoman for BDMLR said: "Many of the injuries would have been received when the whale was washed-up over rocks." Minke whales are dark above and white below with a pointed head. They are found in the Atlantic, Pacific, Indian and Arctic Oceans. Minke whales feed on fish and krill and can be found in groups of up to four.